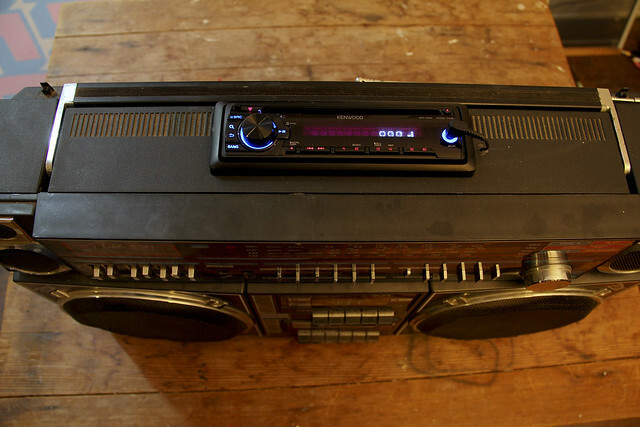 Check out this boom box I bought at a garage sale. Last night I finished fixing it up. When I first got it it sort of worked but sounded really bad, to the point where listening to it was worse than not listening to a ghetto blaster at all, which is pretty bad. 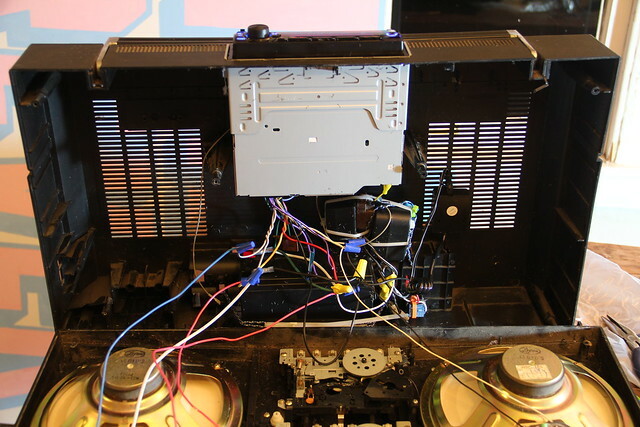 Rather than try to figure out what was wrong, or whether any of the electronics in a LLOYD’S brand boom box are any good at all, I replaced them with a car stereo. Here’s what the insides ended up looking like. The main things I added are a deep cycle battery, a charging setup, and an iPod charging setup. I hooked it up so the original power switch still turns it on, which is sweet. 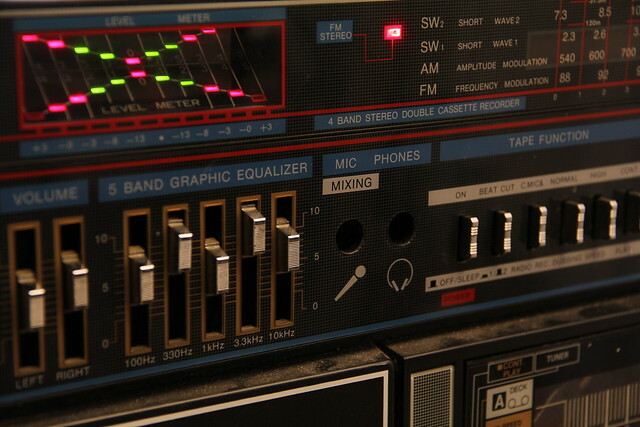 The button next to it, the Beat Cut button, no longer cuts the beat. Now it turns on the iPod charger. The FM STEREO light indicates that the iPod charger is on. Also, I got the green and red LEDs on the left to work as a level indicator, just like they did originally. That led setup is awesome. It’s just the lower leds in there, and then a mirror above them to double how rad they look. Here are two little circuits I built while doing this. The one on the left is the iPod charger. 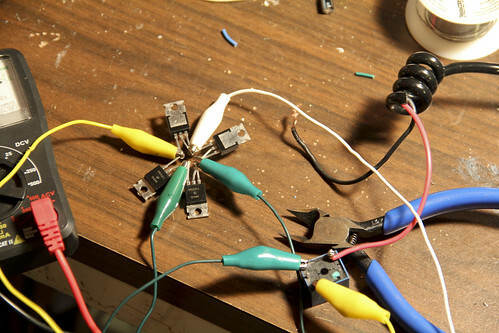 It takes the 12 volts from the battery down to 5 volts and then uses resistors as a voltage divider to let the iPod know it’s hooked to a charger. 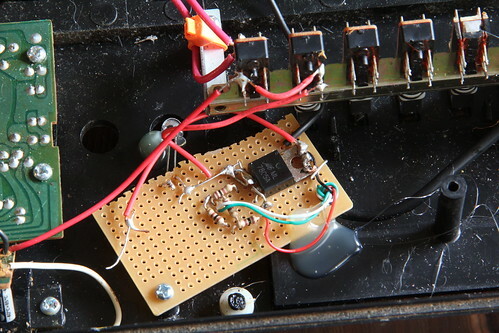 I liked building this circuit because the voltage limiter I used is one of the oldest electronic parts I have around. It’s not an antique or anything, but I bought it years ago for something and then have used it temporarily in a few other circuits and it just kept getting more stuff soldered to it, and the leads got worse and worse, and I think I still have the diagram of the pinouts somewhere from the original radio shack package. Anyways I’ve had it a long time and finally found a good use for it. I should probably add another one or two actually, because it gets pretty hot when it’s charging something. And the one on the right is a voltage rectifier, which makes AC into something like DC. I didn’t end up using it, but it was fun to make because I had never made one before. I was going to use it to turn on the relay that connects the charger to the battery but I ended up just including another AC/DC converter because of how hot this rectifier setup got. I’m pretty sure the converter is more efficient. Here’s the back. The power cable is just for charging the battery. the red light on the left means that it’s charging. I don’t know how long the battery lasts yet, but one day I played cds for about 4 and a half hours and it was still going strong. 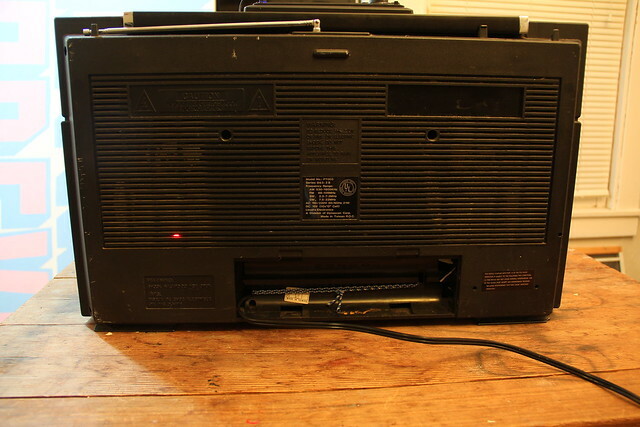 Here are a couple gratuitous gifs of stuff on the boom box working. Yes! 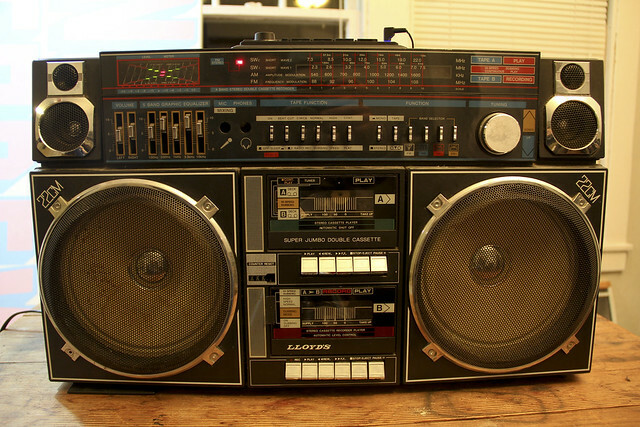 I have already gotten another (smaller, but still pretty badass) boom box to work with. It might take me forever to get around to it. hahahaha!! too cool! rock on D! where can I get 15-25 off thouse?